On perhaps the last great Fall album, the band (or group) as Mark E. would have it, attain a musical discipline and directness that often eludes then. But something else and more interesting happens too. Mark E. treats the language and synthax of these songs as malleable and interchangeable constructs. Key lyrics and phrases from one track are added to other tracks and it is almost impossible to completely separate lyrically the tracks on the album. Mark thoughts are all intertwined and co-joined and perversely this all takes place over some of the most lock step and driving rhythms that the Fall ever recorded. Eleni Poulou keyboards adds great textures and resonance throughout and elevate the sound in subtle but vital ways. 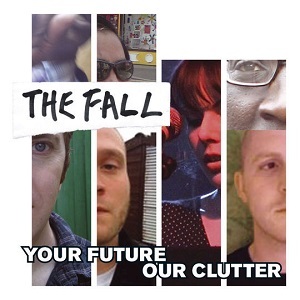 It seems there was a determination with this album to reassert the status of the Fall. Perhaps there was pressure from Domino to delivery a coherent and consistent collection. Somehow it seems with the start of each decade the Fall deliver the goods, think of Grostesque in '80, Extricate in '90, The Unutterable in '00 all outstanding albums and Y.F.O.C. is no exception. Perhaps Mark was more concerned with a symbolic good start to the decade than he would care to admit (first day back at school, first day on the jobsite, etc.). On this second outing from the technically longest lasting and almost final version of The Fall, Mark and the band attain a degree of intensity and creativity that rivals any period of their constantly changing history. There are two standout tracks," Bury Pts. 1 & 3" and "Weather Report 2" (note these titles indicate their transient form) but the album works more as a deconstruction of the notion of individual tracks and "song" structure. There are two tracks that almost share the same name," O.F.Y.C Showcase" and "Y.F.O.C./ Slippy Floor". But in "Hot Cake" Mark sings, "all I get is a slippy floor" the "chorus" (of the previous mentioned track) and tellingly "my dialogue is stuck." "Slippy Floor" has references to "Funnel of Love" covered later on the album. And "Mexico Wax Solvent" must be some derivative from the previous album Imperial Wax Solvent. Mark is not only digressing between tracks but between albums. Many visual artists are essentially self-referential but not many can do so successfully within the confines of "rock." This is what makes this album so special. While it certainly is a tight well recorded collection of driving and often brutal rhythms Mark elevates the zeitgeist into the realm of "why songs," why individual pieces, he hints that they all could have been reconfigured, re-conjoined, re-imagined and still work. His approach suggests that he considers nothing is fixed and the recorded versions are almost arbitrary versions of his vision. Lyrics and phrases are not tired to particular rhythms patterns Mark warns, challenging one of the key structures of rock or any popular music. And yet these are great rock tracks. "Bury " starts muted but strident, the sound deliberately restrained, then clarity and drive are brought into sharp relief. And interestingly the vinyl edition contains two additional tracks and a significantly different running order from the digital versions. So which is the "true" album? Neither, of course. The vinyl does contain another first for the Fall. "986 Generator" an almost straight-ahead blues stomper, like nothing they ever recorded before. Why this, why now? Why not, it seems. As always there are no easy solutions here, Mark seems reflective, concerned about the future and his own well being. It seems like a mission statement and his view of the world is a benign one, to be honest. "When do I quit this Hell? When do I quit this hospital? And in "Weather Report 2"
You gave me the best years of my Life"
And yet the bulk of the music on Y.F.O.C. is brutal and unrelenting suggesting a desire to pummel the listener (and imitators) into submission. However, one version of the album ends with one of the most reflective and haunting pieces Mark ever recorded, on a par with "Bill is Dead" (from Extricate), the chilling ‘Weather report 2" Mark draws us in, lets his guard down, is completely open and honest and then chides us the listeners and his confidante with "you don't deserve rock ‘n'roll." Somehow this suggests that he still believes in rock ‘n' roll himself, "the rock ‘n'roll dream, rock ‘n rock as primal scream." It's so unexpected to hear him utter this phrase given the preceding music, yet he sounds completely sincere, devoid of irony. He remains an enigma to the end.